Len Prince "Plate 49 (Pygmalion)" Jessie Mann Self Possessed Series (c) 2005 Len Prince Collection of William K. Zewadski. 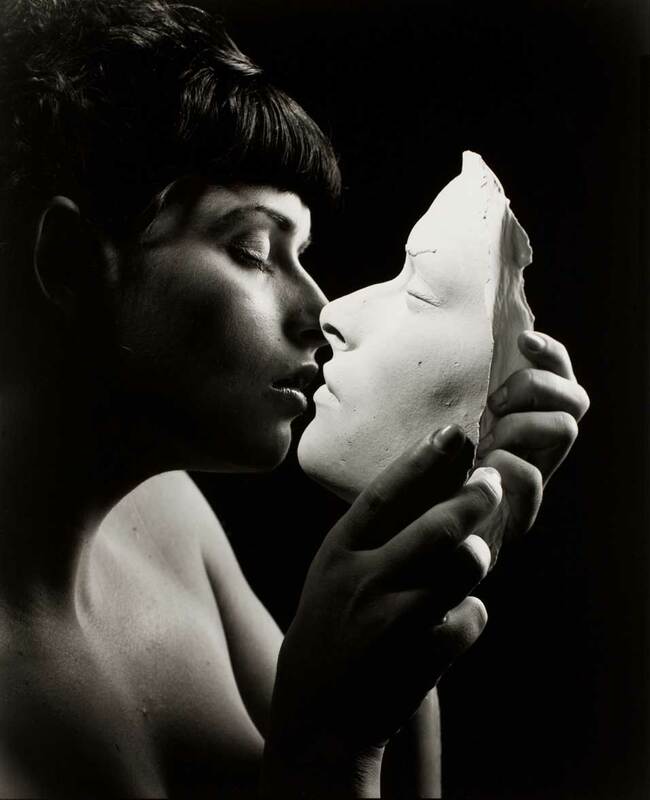 TAMPA, FL.- The Florida Museum of Photographic Arts presents “Masks & Identity: Len Prince in the Collection of William K. Zewadski.” The exhibition runs through August 2, 2008. Len Prince arrived in New York in 1972 and built an impressive reputation for his photographs that have appeared in Vanity Fair, Interview and InStyle magazines as well as for his work for Estee Lauder and Cartier. He is especially recognized for his portraits of celebrities as seen in his 1997 book, About Glamour. Portrayed in the style of 1930s Hollywood publicity stills, Prince’s luminaries (Patti LaBelle, Drew Barrymore, Patrick Stewart and Kevin Spacey among others in the exhibition) wield the force of their fame through faces they have crafted and perfected. These celebrities advanced their careers by building their public masks, something Andy Warhol recognized when he made portraits of Marilyn Monroe and Elizabeth Taylor. Warhol portrayed their media masks, not their souls. Warhol dealt with the power of the media image, but Prince is truly fascinated with the power of the masks’ magic, as seen in his images of nudes wearing African masks. While prehistoric hunters worshipped their nature gods, the masks' creators used masks to acquire the strength of their gods and to channel the powers of the divine. Today, of course, we worship celebrities instead. Prince’s engagement with masks has reached a high point in his fruitful collaboration with his muse, Jessie Mann. Throughout her childhood, Jessie’s mother, Sally Mann, photographed Jessie and her siblings. Her photographs of the beautiful children, intense and sometimes sexually disturbing, created a sensation in art circles. Viewers might have been discomforted because the camera was so psychologically intrusive. Perhaps they felt uneasy because the children were so defenseless when confronted by their mother‘s camera. The only defenses a child could use to wall off such intrusions might be to become angry or else to put up a barrier between the camera and the soul. Another defense is to elude detection by slipping into the role of someone else. While this may or may not be the case, certainly Jessie Mann’s history and Len Prince’s preoccupations have come together in a powerful collaboration.